In each case, clicking on the picture will open the full size version. The map is 2132 * 3018 tiles, i.e. 42km by 60km. It was created from DEM data and I believe I posted a version of it in the maps forum last year. With Experimental's scaling, a 20 metres per tile map runs in real time -- i.e. an in-game second is more or less equal to a real second! 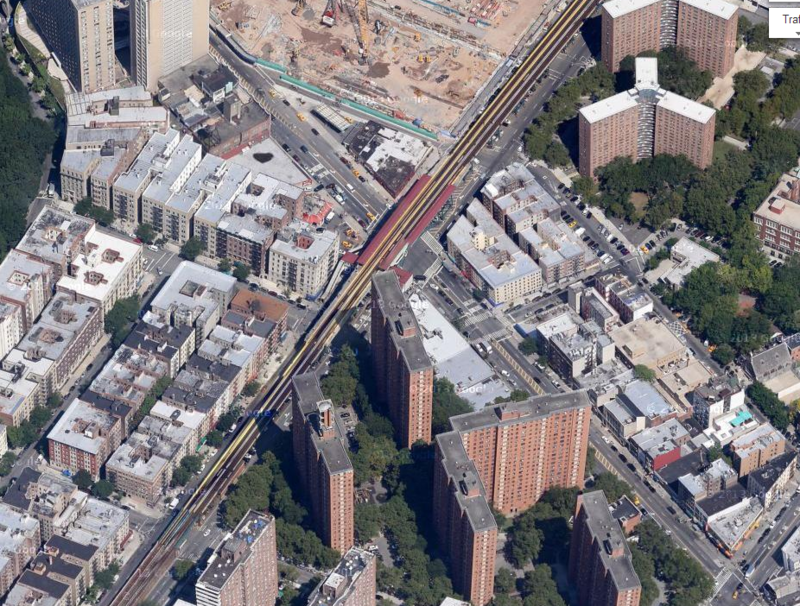 It gets more difficult when the roads do not run precisely straight, of course, as you can see in Lower Manhattan. 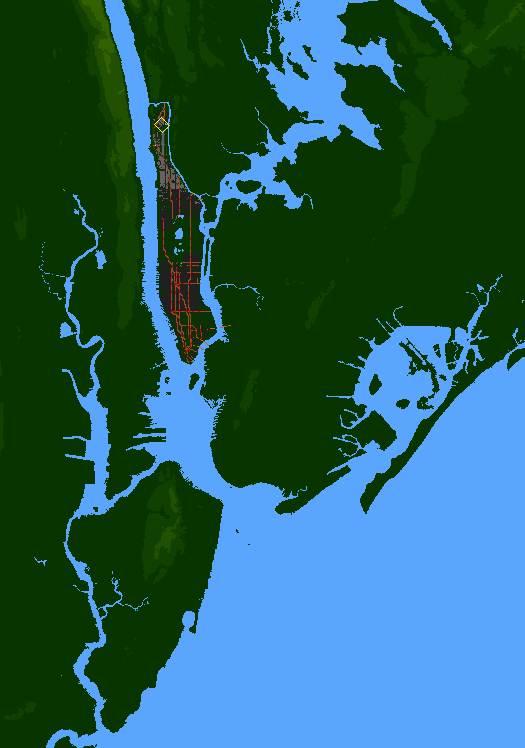 This would make Queens and Brooklyn look pretty messy, I think, if one tried to recreate these as well. This shot also allows you to see some of the buildings. Almost everything here is adapted from pak128 for a 64-pixel tile size. One of the main obstacles to making a complete version of this map would be the huge amount of clicking required to place all the buildings. What's more, lots of buildings in NYC are greater than 20 metres in length, so they should by rights take up more than one square. I think I would be most likely to return to this if it ever becomes possible to place 2x2 city buildings -- which would reduce the workload significantly and make the whole thing look a bit more to scale. 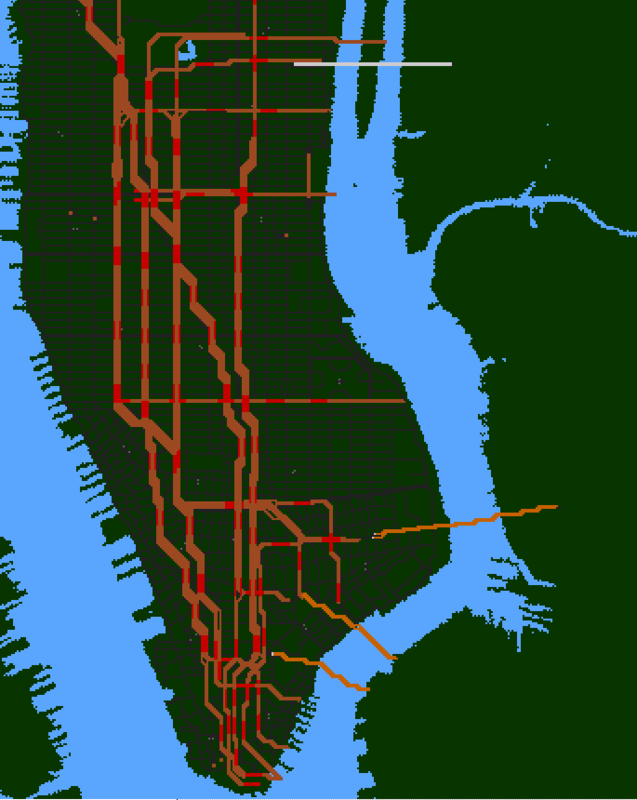 It would be fairly simple to simulate the subway network on this map, I think. The real challenge would be to see whether the bus network could be simulated too. With such a fine-grained scale it would be possible to add almost every bus stop. I tried one bus route, and with the use of traffic lights was able to approximate something like a real timetable. One big obstacle to the bus network would be that at least one route has more than 256 stops in total, which I believe is the upper limit. A more serious obstacle is that it would take thousands of buses to complete the route network, and I doubt my CPU could handle it. As I said at the start, this is not something I consider "in progress". It's an exciting idea, though, and maybe one day I'll be able to do it justice. Gosh. Impressive, and intriguing. As to multi-tile city buildings, if placing manually, one could use attractions instead. Indeed, that is an option; I'd rather not have a map entirely composed of attractions, but I might try it out in a particular area to see what it looks like -- it could be a nice pilot for the idea of a 64 pixel pakset with exclusively 2x2 (i.e. 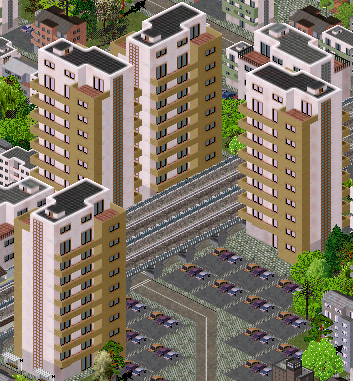 128-pixel) buildings. In the next major version of Experimental, there will be no difference as far as passenger generation is concerned between attractions and commercial city buildings. Very nice! I have a similar project for Vancouver, Canada (at 20m scale), waiting for half-heights in Experimental and I am ready to go. I have been working on graphics addons for the last year for this specific purpose. I originally created it for standard heights but then chose to delay until half-heights were implemented as this will make for a much more fine-grained map elevation-wise. This allows us to fulfill that need to have a model train set in our basement... except a map that is 40,000mx60,000m would require, at 1:150 scale, an area 266mx400m. I doubt my wife would approve of the renovation required for this railroad. That sounds good, James -- I shall try this when that is released, then. I look forward to seeing your Vancouver map, Sarlock! 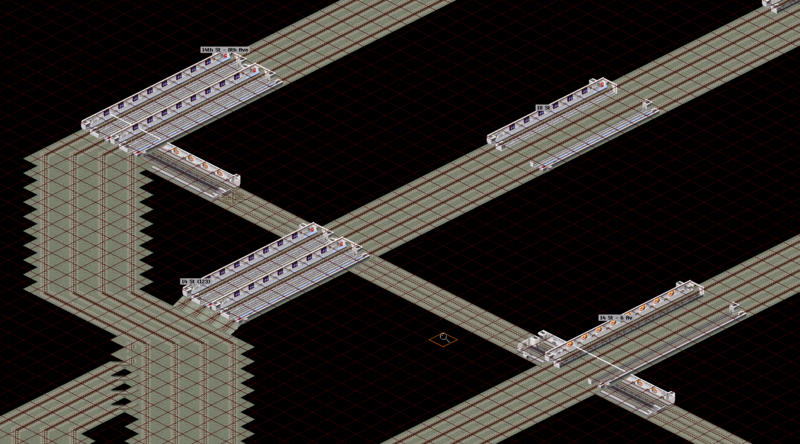 I've only converted a couple of buildings to attractions so far, but the workflow is really quick with Tilecutter, so I should get a lot more done shortly and have some more extensive screenshots soon. Wonderful! I have thought of multiple uses for 128px pakset graphics in a 64px setting. The only problem with this particular application is that the scale of the buildings no longer fits the smaller pak64 ones. 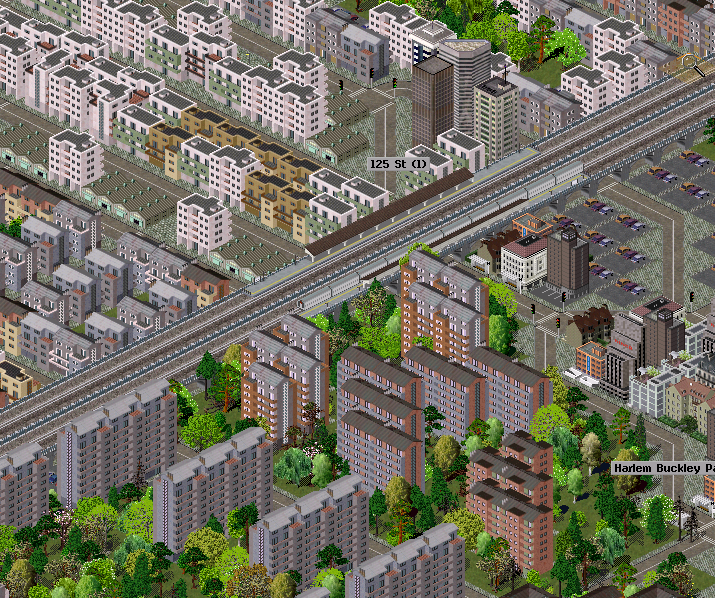 An idea that I have yet to test is using 128px graphics in a pak64 setting except that all of the city buildings are 2x2 attractions and then the roads, still at 64px, are more to scale with the buildings. If we make a 2x2 tile 20mx20m, then a 1x1 tile becomes 10mx10m. This may require some rescaling of vehicles, but in a model setting, you only need a dozen or so varieties and this may not be a big chore. This would change your 2132x3018 map to be 4264x6036 which is still entirely within the realm of smooth operations. Do you have time to Sleep over night? Can you try to post the scoure of those pakset?